The 23rd annual Celebrating Catholic School Values: Scholarship and Career Achievement Awards event will be held at the Crowne Plaza Union Station in Indianapolis on Thursday, February 7, 2019. This year’s celebration features keynote speaker Most Reverend Gerald F. Kicanas, D.D., Bishop Emeritus, Diocese of Tucson, Arizona, and will draw more than 600 guests from the greater Indianapolis community in celebration of Catholic education. This year’s Career Achievement honorees are Jerry and Rosie Semler, Patricia Musgrave and Virginia Marten. Jerry and Rosie are parishioners of St. Pius X Church in Indianapolis and they have seven children. Jerry is the retired CEO of One America and was very instrumental in helping raise the money to build Holy Angels and Holy Cross Schools. Pat is a member of St. Barnabas Church and is a retired teacher from Roncalli High School. Pat began the Special Needs Program (STARS) over 25 years ago which now serves 150 students. Virginia is a member of St. Luke Parish and has dedicated her life to raising her 11 children in the Church. All have attended Catholic Schools. She was a former Co-Chair of the CCSV Nominating Committee for years. Since 1996, this premier event has highlights Catholic schools as assets to the corporate community, honored an outstanding group of alumni for their career accomplishments and honored friends of Catholic schools for their community service. Click on the image to the right to learn more about how your donation helps. 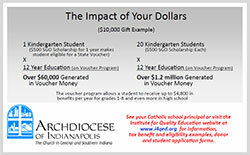 You can make your gift today with the Institute for Quality Education, Inc. application form. This helps us understand how you wish to support Catholic education. Still looking for additional information on the benefits of Catholic education? We can help. Know the facts about Catholic education. We are seeking corporations and individuals to sponsor this event. Funds raised from Celebrating Catholic School Values help provide scholarships to students from low-income families in the 68 schools throughout the Archdiocese. Sponsorship at this premier annual event provides a great opportunity for advertising exposure to the more than 700 guests who attend from the greater Indianapolis community, and more important, it demonstrates your support of and commitment to Catholic education.